In Christmas 2018, Benjamin Pollock’s Toyshop played host to a fantastical cast of characters created by Annie Montgomerie. Her anthropomorphic storybook beings are part toy, part sculpture and each individual piece is unique, being made from 100% wool felt, up-cycled fabrics and vintage charms and jewellery. 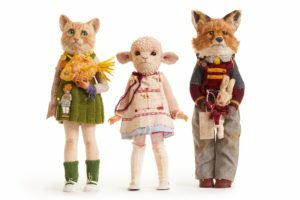 The curious creatures travelled from the countryside to the city to appear in a Christmas Display of Pinocchio inside the Covent Garden store window of Benjamin Pollock’s Toyshop during November and until 18th December. The 8 pieces were offered for sale and because of the high demand for Annie Montgomerie’s work, we ran a raffle for the chance to purchase a piece. We sold 62 tickets at £5.00 each and £310.00 + gift aid has been donated to the charity MIND on behalf of Annie Montgomerie and Benjamin Pollock’s Toyshop. All the dolls have now been claimed. We are sorry to disappoint those who were not able to buy a piece from us but we were pleased that lots of people got to see Annie’s work on display. This spring we will be releasing our second podcast in the series called Holding Up The Queue where Simon will discuss anthropomorphism with artist Charlotte Cory. To accompany this we will be releasing some limited edition Annie Montgomerie postcards.